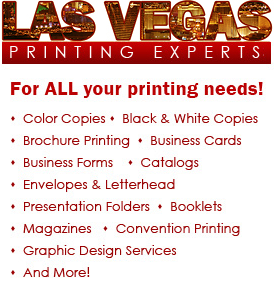 Las Vegas Printing Experts (LVPE) is a full service copy & printing company. We are able to service your needs in our new state of the art facility. If you are looking for color copies, black & white copies, brochures, manuals, or graphic design, you have come to the right place. We can print everything, including oversize posters, banners, marketing materials, and that large copy project that needs a fast turnaround.